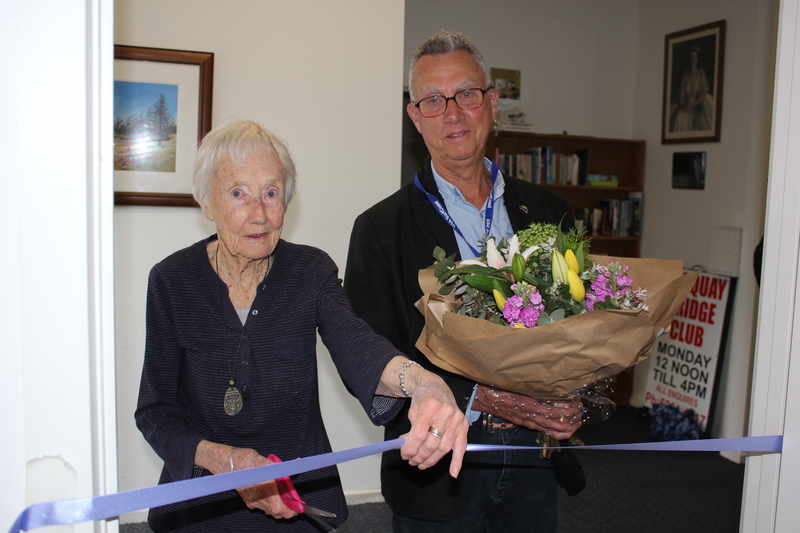 As part of this year’s Victorian Seniors Festival our new office was opened at the Senior Citizens Club in Price Street. The cutting of the ribbon was performed by Valerie Buckley, our oldest member aged 95. Then followed a display of some of our classes and activities after a speech from the Mayor of Surf Coast Shire, Cr David Bell who commended U3a SurfCoast for what it was contributing to the Surf Coast community. TaiChi tutor, Marie Moulday, and some of her students demonstrated one of the shorter movements and June Marks introduced the mini exhibition of her drawing students. Kim Burrell, one of the Ikabana students introduced us to the craft and explained how it combined his love of gardening and Japanese culture. The demonstrations concluded with readings from the Creative Writing class- John Peck and Robin Purdey on aspects of memoir and Anthony Ash brought the house down with his story of a very efficient dentist. A beautiful afternoon tea had been prepared by Libbie Lourey together with Sue Newson, Judy Barber and Robin Loane, attended by U3a members along with Shire Council staff who had been responsible for setting up the new office – Shaan Briggs, Jess Bennett and Olivia Naughton. Members of other Seniors groups also attended including Probus, Seniors, Torquay Improvement Association, Lions and Mens Shed. This was a wonderful afternoon and a fine example of collaboration between Seniors groups and local government.